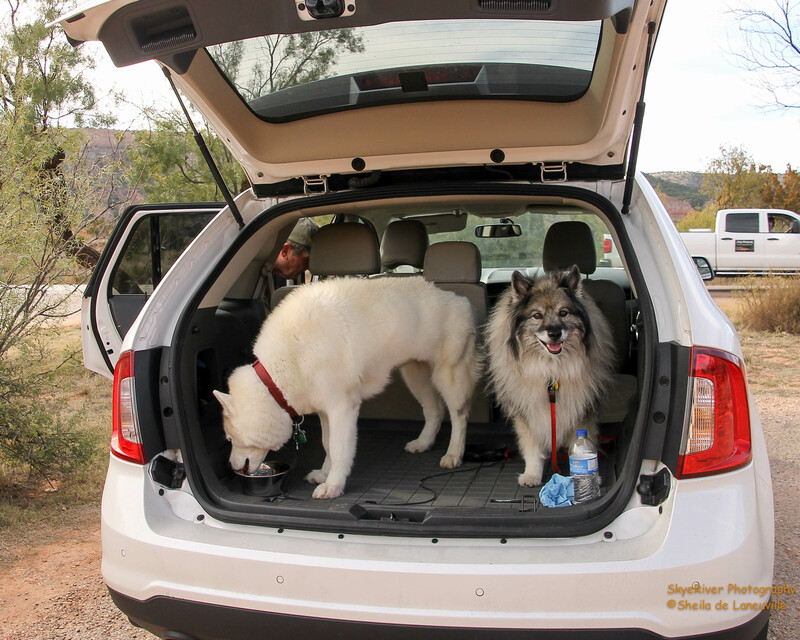 After talking them into riding along with a treat once we got there, Howard and I loaded the car with snacks, water, doggie treats, binoculars, cameras and jackets. Who knows when one might need a jacket. As our way of enjoying an area, we took “the back way” traveling farm-to-market roads, which twisted and turned through agriculture and cattle country. It was a pleasant and scenic drive. Upon arriving at the state park, we stopped at the visitor center to check on the status of our annual Texas State Park pass. Our pass had expired so I renewed for another year. We love staying in and visiting Texas State parks. The friendly rangers processed my request and we were on our way – traveling the ridge of the canyon to its base. I was driving while Howard was navigating. We passed many pullouts, hiking trailheads, another visitor center, the beautiful amphitheater where the musical “Texas” is performed, thinking we would stop at some of these places on our way back. We finally reached a parking lot with a restroom and because of construction, this was as far as we could go. 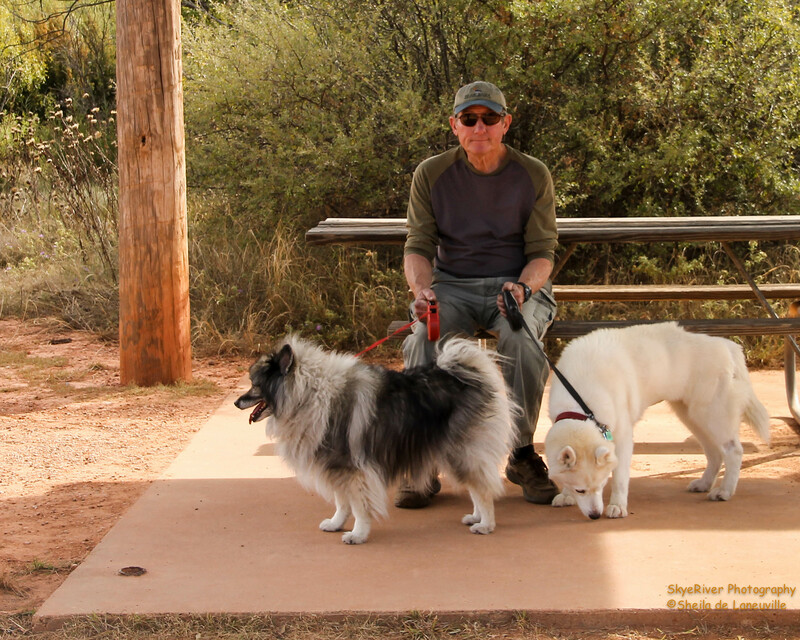 We pulled into the lot, thinking we would walk the girls and just enjoy the beauty of the area. As we pulled up and shut the engine off we smelled a strong, burning scent. I said to Howard, “someone must be cooking lunch”. One of the parks RV campgrounds was near by. Well, no one was cooking lunch; we noticed smoke coming out from under our car. 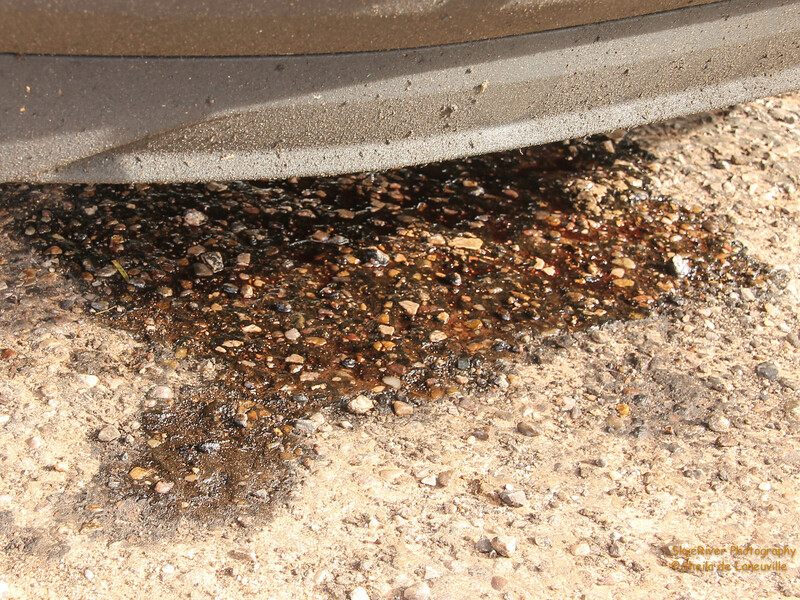 Upon further inspection we noticed a pool of liquid under the front hood, which turned out to be the power steering fluid. It was spattered all over the ground. The power steering reservoir was empty. Let me just back track a bit here. Before we left Loveland we had our car at the Loveland Ford dealership to fix what Howard thought was a small leak in the power steering system. They also fixed the brakes, again leaking fluid. We paid them a good sum of money for their service! As we stood by the car, probably looking at it as if it has just landed from outer space, a very nice couple, David and Nancy, stopped to see if they could assist. 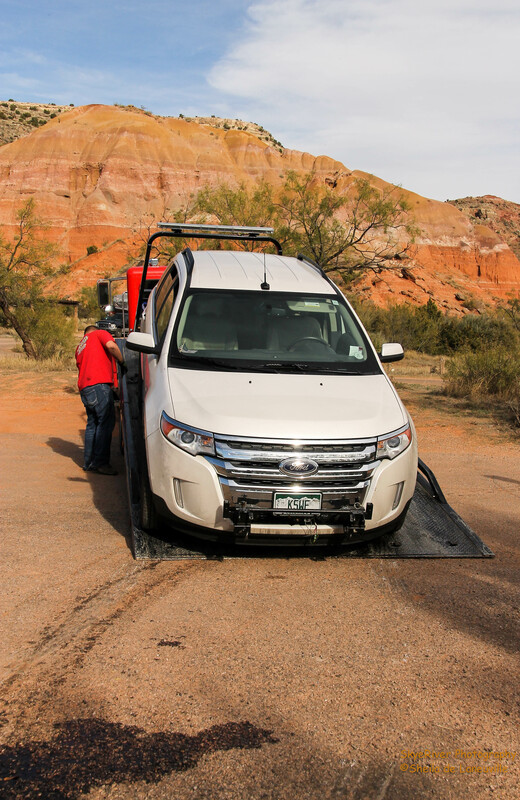 They provided us with friendly conversation, smiling faces, RV stories, tools, and finally a ride to the entrance of the Canyon visitor center. No cell service where we were, nada. 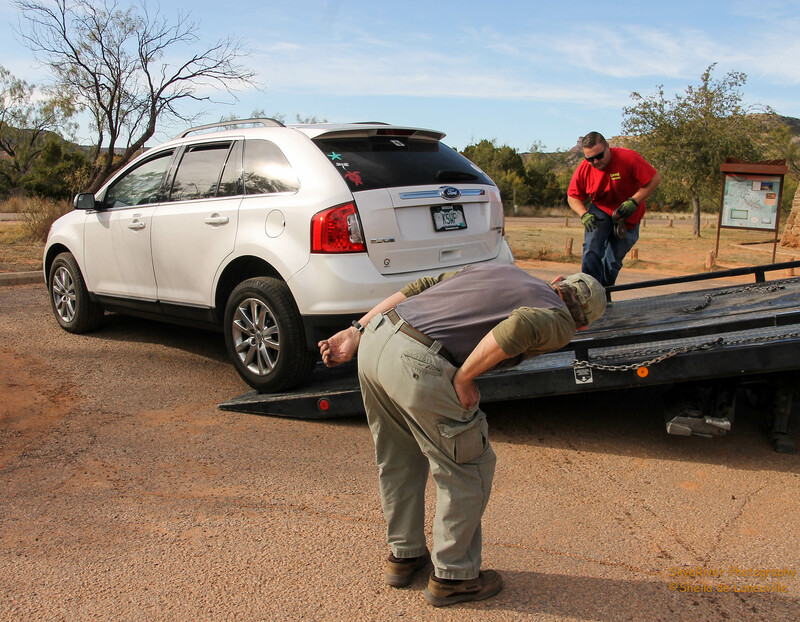 At the visitor center Howard spoke with the rangers asking them if they could recommended a towing company; they gave him a phone book and he selected Canyon Towing. Nice name and how appropriate. 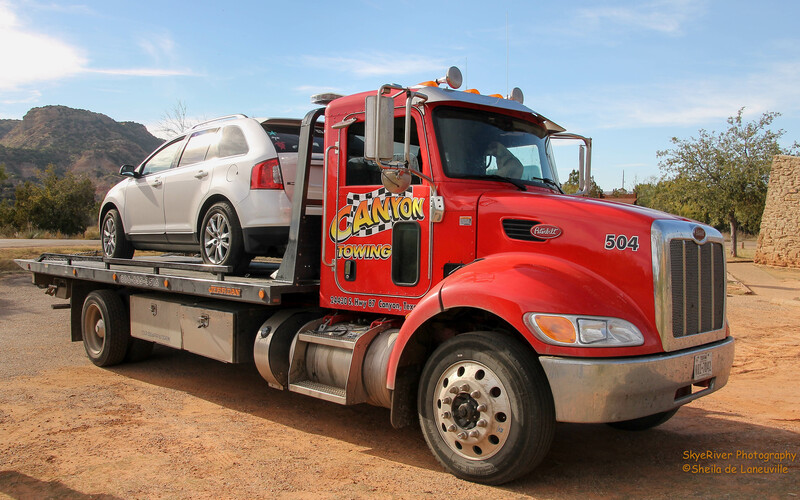 Canyon Towing told us that a tow truck would be along in an hour. True to their word the tow truck showed up right at an hour. 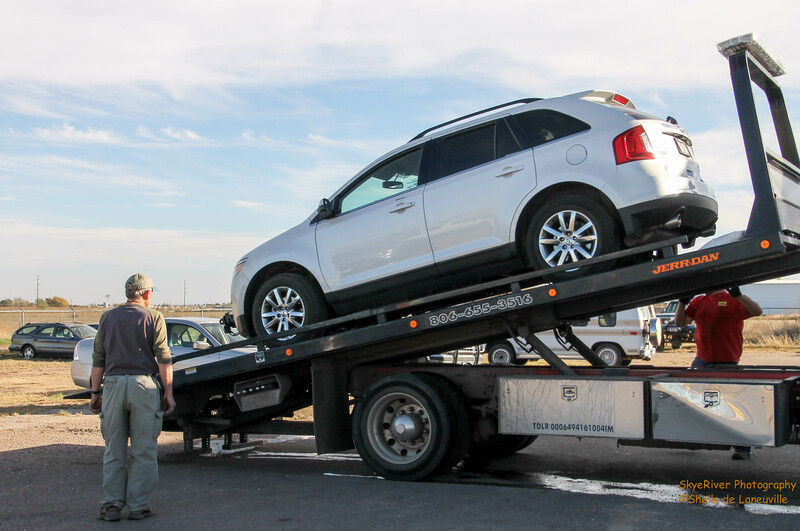 It didn’t take long before our car was loaded onto the flat bed truck. 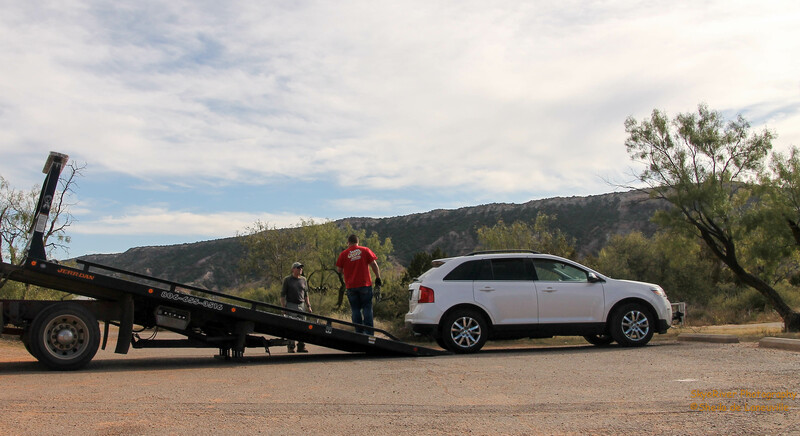 The girls had to ride in the back of our car, which was on top of the flat bed tow truck. We made sure all four windows were rolled down enough to give them plenty of air. I hope their experience wasn’t to0 traumatic. Howard and I rode up front in the cab with Chip, a very nice young man originally from a town on the Idaho/Utah border and his cute little doggie Poncho. Chip drove us to a Ford Dealer between Canyon and Amarillo, where we left the car, received a courtesy ride back to the RV park, made an additional reservation for Wednesday night, and de-stressed by eating what was left of the chocolate cake from our dinner last night at The Big Texan. I did manage to take a few photos from the parking lot while waiting for the tow truck. I hope one day we get to return to Palo Duro Canyon State Park to enjoy its unique beauty. Oh no! David and Nancy were so kind to help you. I’m glad you were able to get a tow truck and extend your stay another night at the RV park. I hope your car will be repaired quickly and you can be on your way soon. Beth, we can’t imagine driving an RV down into the canyon, but people do. I was driving and didn’t feel anything wrong with the steering. I am glad the problem happened where it did. Yes, there are generous, friendly, sweet people RV’s and this couple sure did help us out. The wind is blowing here in Amarillo this morning! 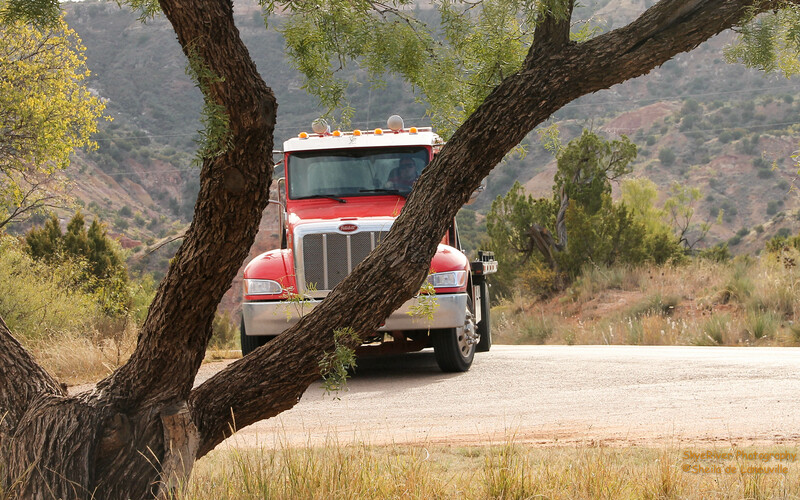 Have you ever attended one of the “Texas” performances in the canyon? It looks like it would be amazing!! We towed our fifth wheel into the canyon and loved camping there. We’ve never been to one of the shows. Yep! The chocolate cake helped; nothing like chocolate is there? They were working on a section of the highway, so you just had to turn around and go back the same way, instead of driving a loop. We saw and read about where the flooding takes place. I bet it happens often. It sure looks like a beautiful place to camp and hike.